A seed potato is a potato that has been grown to be replanted to produce a potato crop. It’s the usual way that potatoes are made available to farmers and growers – although it is possible to produce potato seeds (also known as True Potato Seed, TPS), it is unusual to do so. A potato is a tuber, a way for a potato plant to store energy so that it can regrow next year. 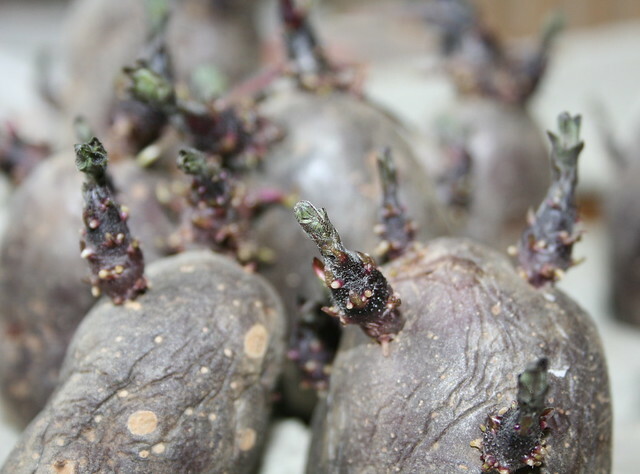 In spring, potato tubers will start to sprout new growth from growing points called eyes. Each potato has several eyes. Although the potatoes in your fridge will start to sprout if you keep them too long, it’s not recommended to plant those in the garden, because they could be contaminated with blight spores and viral diseases. For the same reason it’s also not a good idea to let leftover potatoes (volunteers) sprout in your vegetable garden. Seed potatoes are guaranteed virus free. In the UK many of them are grown in Scotland, where the climate doesn’t favour the aphids which spread virus diseases elsewhere. Some potato varieties are made available as microplants or microtubers – plants and tubers that have been produced in sterile lab conditions to ensure that they’re disease-free. This is usually done for heritage/ heirloom varieties, not the most popular ones. It’s also now possible to buy dual-purpose plants that grow both potatoes and another crop – e.g. the TomTato and Egg & Chips plants – but note that these plants will need extra feeding and watering to produce a good crop of either vegetable. Shopping for seed potatoes is a lot like shopping for potatoes in the supermarket – ideal candidates are firm and free from blemishes. Later in the season they will start to sprout; it’s OK to buy seed potatoes that have formed short, green sprouts, but it’s not a good idea to buy ones that have formed long, white and spindly sprouts as these are very fragile and likely to break off when you plant them. Seed potatoes are generally available to buy from late winter through to mid spring (January to April in the UK), although you can order them online/ mail order as soon as the new season vegetable seed catalogues start to arrive. Order early and you’ll have your choice of varieties; later on you may be able to bag a bargain, but you’ll have to make do with what’s left. Potatoes are such a popular crop, and there are so many varieties to choose from, that Potato Days are popular events where you can buy seed potatoes from the widest possible choice of varieties. Local nurseries and garden centres will stock a limited range. How do I choose which potatoes to grow? The potato varieties you choose to grow will depend on a lot of different factors, starting with your location and which varieties have been developed to grow well there. In many areas potatoes suffer badly from late blight disease, which can greatly reduce (or even eliminate) a crop. 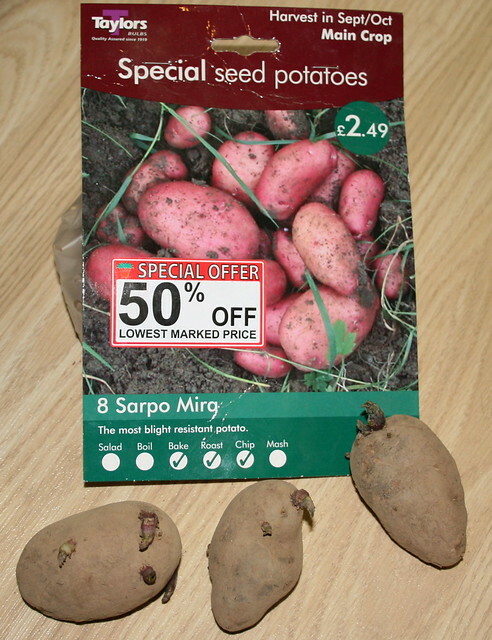 Choosing a variety with blight resistance, such as the Sárpo varieties bred by the Savari Trust, can save your potato harvest. The primary distinction between different varieties is when they will be ready to harvest. In chronological order, the categories are: First Early, Second Early, Early Maincrop and Late Maincrop. Salad potatoes are generally early, waxy varieties. First earlies can be planted from early spring (the end of February in the UK) through until late spring, although earlier plantings will have to be protected from frost. They produce small ‘new’ potatoes in about 10 weeks. Second earlies are planted a month or so later, and take 13 weeks to produce a harvest, but the goal is the same – small, new potatoes. Early and salad potatoes are ideal for growing in containers. The Maincrop potato varieties are more suited to growing in the ground, and the aim is to produce larger crops of larger potatoes in 20 weeks. They can be planted from March (Good Friday is a traditional planting date, although the weather is not always suitable, through until late spring. ‘Second cropping’ seed potatoes are a bit different – they are planted in August for autumn/ winter crops (but must be protected from frost) around 11 weeks later. Once you’ve decided which type of potatoes you want to buy, it’s down to choosing the individual varieties based on how you want to use them. Variety descriptions will include information on whether they’re good baked or boiled, mashed or roasted, or if they make the perfect chips (French fries). You can choose from modern or heritage varieties, producing different sizes of potato, with different coloured skins – and even different coloured flesh! For most gardeners it comes down to a choice of which varieties grow well in their garden and the ones with the best flavour or that store particularly well. Once you’ve chosen your seed potatoes, its normal to chit them, by setting them out in the light to grow short, green sprouts. This gives them a head start before you plant them out, and also prevents them from growing the delicate and spindly white sprouts they would produce when kept in the dark. Whilst you’re waiting for your seed potatoes to sprout, there’s a whole range of basic gardening advice to get your teeth into. Or you could get adventurous and learn about some potato alternatives. 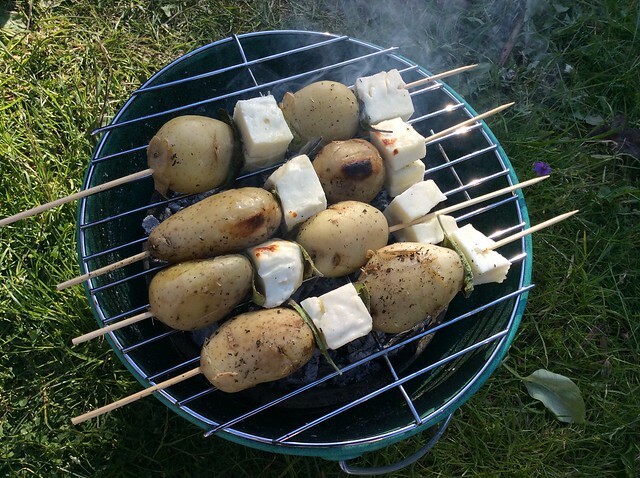 Once you’ve grown your potatoes, I’ve got a lovely recipe for Simple seasoned wedges over on my food blog – or you could just try it now! Provide your audience with gardening tips by live streaming video tutorials & tips using a cloud based virtual desktop remotely accessible anytime and anywhere on your favorite mobile device with CloudDesktopOnline.com. For innovative cloud based solutions visit Apps4Rent.com. Anyone able to recommend good varieties which will grow best inspite of slugs. I use the ‘no dig’ method of growing? On Twitter this morning, Wendy Pillar said her ‘Apache’ potatoes weren’t bothered by slugs, although different varieties nearby were. My Sárpo potatoes weren’t bothered by slugs last year (Kifli and Axona). Does anyone else have recommendations? Our Sarpo Mira’s seemed untroubled by slugs and my Dad swears by King Edward’s for not getting eaten by the slimy slitherers. Slugs certainly bothered pink fir apples last year on the allotment although desiree, maris peer and vivaldi all produced lovely clean crops. Desirees and maris still eating well, vivaldis well munched ages ago. Wow, the blessings of potatoes! Well worth it. A thought: the allotment had been dormant under black plastic for two years before I got at it Mar 16. One more bed to go, so a repeat of last year. My 3rd year ther will be the proof of the pudding.